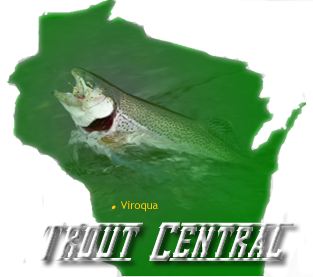 “Trout Central” is a region of limestone bedrock, located within the driftless region of Southwestern Wisconsin. Limestone bedrock streams are usually referred to as spring creeks that are rich in minerals. It’s the minerals, dissolved from limestone, and suspended in the hard water streams that are the basis for the food chain. Trout anglers often talk about two kinds of trout streams, spring creeks and freestone streams. The primary advantage of limestone streams is their trout food production. A trout angler and scientist called the minerals in the water dissolved from limestone bedrock, “trout fertilizer.” Growth rates of trout in the mineral rich limestone streams can be astonishing, from one-half to one inch per month. Brown trout swimming in the average freestone (soft water) stream will not grow to 20 inches in a lifetime. That same trout swimming in a rich spring creek can grow to 20 inches in four years. The water supply for a spring creek comes from an underground source. Therefore, the water flow in a spring creek is dependable year round. A two to three months drought will have little impact on the water flow in a spring creek. However, the drought will cause a shortage of water flow and high water temperatures detrimental to the survival of trout in a freestone stream. It took me approximately three years of research, and a lifetime of Wisconsin trout fishing, to identify the 100 best Wisconsin trout streams that are listed in order of priority in SPRING CREEK TREASURE Wisconsin’s 100 Best Trout Streams. Thirty-four of the 100 best are spring creeks located in the following six counties of Southwestern Wisconsin; Vernon (11), Richland (9), Monroe (4), Grant (4), Crawford (3), La Crosse (3). Within sixty miles of Viroqua, Wisconsin, (my home and a place I call “Trout Central”) you have access to 34 of the 100 best trout streams in Wisconsin. It’s a peaceful country of verdant hills and valleys, where you are at ease and feel welcome, with miles of streams to wade and trout to catch.